Hundreds Of Calif. Homeless March For Land Rights In Sacramento, hundreds of homeless demonstrate in hopes of securing land to sleep on. In recent months a tent city and a city shelter have closed. With laws that prohibit sleeping in public places, these individuals say it is now illegal for them to exist. 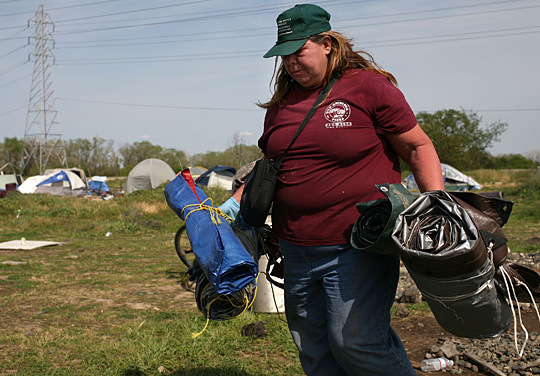 Karen Hersh, a homeless woman, carries her belongings at the tent city in Sacramento. She and hundreds of other residents living in the tent city along the American River were issued notices of eviction by Sacramento police and told to relocate to a shelter at the Cal Expo center. It has been about three months since city officials shut down a large "tent city" occupied by Sacramento's homeless people. Now, some of the tent city's residents say they feel like refugees, with no place to go. They staged a loud demonstration Wednesday, in hopes of pressuring Sacramento officials to find them a new place to camp. Philip Grice, 45, has been on the move ever since the tent city closed. "When we moved out, we moved over to a private area two fields over. They wanted us off of there too. Just like shuttling cattle, that's all it is," said Grice, a carpenter by trade, who wears a T-shirt that reads, "Where am I supposed to live?" "We're supposed to be the eyesore, but actually we're citizens and we're human beings. We're supposed to have rights like everybody else; it don't matter what we have in our pockets." Grice joined about 250 other homeless people and their supporters for a march through the northern end of Sacramento. Their action coincided with the closure this week of a temporary shelter where many of the tent city residents had found a roof for the winter. Now these individuals say they need a year-round legal camp on what they call "safe ground." Rodney Frazier, 43, a single father and disabled brick mason, participated in the march. "A lot of these people are brick masons, they are tile setters, they are dentists, they had some very nice jobs," said Frazier. "They contribute to the world, to society, and they had a downfall in life. They need help getting up." The march ended up in a hot and dusty city-owned lot next to a police station, where organizers set up a symbolic occupation. Val Jon Farris, founder of a group called iCare America, set up a tent on the lot. "There is no legal place for people to live unless they own, rent or lease a home. So if you're homeless it's illegal to exist. You can't even lay your head anywhere without getting arrested, prosecuted or criminalized," said Farris. "So this is a demonstration in order to create a civil liberty that ought to already exist, which is [that] people have the right to be, to live without the threat of being incarcerated in their own country." Sacramento police officer Mark Zoulas, who has served on the homeless beat for the past decade, said a legal campground makes sense to him. "You need something for that immediate need," said Zoulas. "I like the winter shelter. I'm not saying that's the best answer in the world necessarily. But at least it gives you a choice. And that's now closed and everyone using it is out. And that leaves, for the minute, nothing, and nothing is never the answer." The idea of a safe ground for homeless campers divides officials in city hall. The mayor, Kevin Johnson, has been receptive, but others, including the city manager, Ray Kerridge, is not. There is also a disagreement over how much it will cost at a time when the city and county are already slashing basic services. What is not in dispute is that this week Sacramento has 200 more people with no place to sleep.